NASCAR Racing The worlds largest professional racing series. Are you a fan? Discuss all things NASCAR here. Below are the rules for the 2014 NASCAR Fantasy League on the Monte Carlo Forum. 1) Each participating member may choose up to three (3) separate drivers for each race. The person may choose any driver entering the race, not limited by points standings, starting position, or anything other than the rules set by the MCF Fantasy commission. 2) Each member will receive the points from their three driver race results added to their own points tally. In this manner, a running points standings will be kept of each member. 3) All choices must be entered to the forum by the time of engines cranking to begin the race, not at that time or after. Any picks or edits made after this time will be disqualified. 4) Segment Points will be reset every 9 weeks, so that in 36 races, there will be 4 segments, with an individual winner of each segment. At the end of the year, the overall points for 36 races will determine an overall champion of the entire season. So for clarity, each season will have 4 Segment Points winners, for each 9 race span, AND an overall champion. 5) Any penalties that any of your picks earn points wise for the entire year will also be taken away from your own points for the respective weekend of the infraction. This may include any violations made by the crew chief, driver, team, or any respective reason why NASCAR may penalize a driver. To "wash my hands" or responsibility for this, I will tie my decisions to NASCAR's decision, no matter how unfair it may seem. Any penalty involving probation or money only will not result in any points loss. 6) Non points races, namely, the Budweiser Shootout, the Gatorade Qualifying races at Daytona, or the All-Star race at Charlotte, will have no affect on your points standings. We will make picks for these races in good fun. 7) All picks must be made in a thread that will be created by either by Cowboy6622 or his designee for that weekend. The threads title will follow this formula. [ Picks/Race/Day&Time of race ] For example [Picks/Daytona/Sun. Afternoon] If they are not posted to that thread by the given time, your choices will not be counted and you default for the week. An exception is made for any member who clears a reason with Cowboy6622 and makes it clear why such an exception should be made. For example, members have personal messaged me their picks for weeks where they would be on vacation, and this has been considered acceptable. 8) Tie Breakers: In the event of a tie in a single event, the tie will be broken by looking at the first picks. Whichever first pick came in ahead of the other members 1st pick wins, then on to the second and third picks. If the picks were the same, then the first person to post the picks gets the spot. If a tie results in the final points, then the winner of the segment (for segment points) or season (for overall points) will be determined by the number of wins in that particular segment or season. If there are the same number of wins, then 2nd places, 3rd places, etc. will determine the victor. 9) Have fun, and enjoy the races. That's what this is all about. 1) Should there be any reason that a MCF NASCAR Fantasy participant feels a penalty was assessed against them unfairly, or that "rare circumstances" apply, they may request an appeal. They may do so by making a public request in the forum for that race, or by messaging any moderator, or myself. 2) A member of the MCF moderator staff, who must meet the following criteria, will decide the issue. b) The moderator must be agreed upon by both Cowboy6622, or his designee for that time, and the member making the appeal. 3) The decision of the moderator chosen by group will make a binding and final decision on the matter that will be agreed upon by both parties. I think this will be a blast! I still will continue to try and pick last, number of cautions and the first caution causer, but I understand I won't be scored on it. Thats fair enough. This is my biggest goal in life right now. 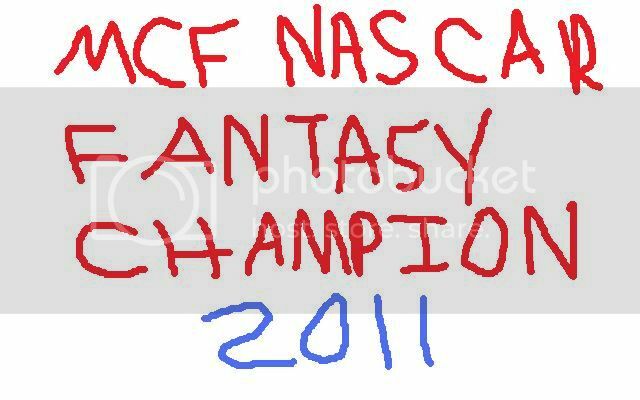 I want to be the 2011 MCF Sprint Cup Champion!!! Great to read that you liked `Duanes rules 4-Sure. He put a lot of time & effort in2 it. Sure hope that more member's get involved in the Game. Thanks for all your input on this subject. I've always used "HoHo Racing". It is a name older then myself. Before I was born, my father had an actual Late Model racing team they called HoHo Racing, defined by a plastic Santa that was sort of a mascot to the garage they worked out of (they callled the garage the "HoHo"). That racing team continued to exist for probably 40 years and a few years ago I was on the team myself for a few years - still the same driver my father was crew chief for (my godfather actually). The real race team has closed up shop for now (the "HoHo" was torn down 25 years ago), but I'll keep the name. I've said it before. I live this stuff. Glad you like it Brent. I guess this makes it offical. I don't really like a lot of rules ,but I want something I can back up to if I have an issue with something later on in the season. And I wanted bonus points, but they were a source of confusion, and people would get pissy not understanding the rules. So I guess this is it... it's going to be a blast. They;re really screwing up the fantasy league at NASCAR.com You get points for finish position, start-finish ratio (start on the pole and finish 5th, -4 points), points for leading laps, adn points for fastest laps. So the pole sitter is a guy to avoid every week. You want a guy look Carl Edwards, Matt Kenseth, Denny Hamlin, or someone who just doesn't qualify well but gets there at the end. Kevin Harvick even falls into this category. You also want someone who charges hard, like a Kyle Busch who runs fast laps and leads laps. And I joined your team, Brent! Last edited by Cowboy6622; 01-29-2011 at 03:47 PM. There's no way anything short of a super-computer could score what they got going on over at Nascar.com, but I had to check it out - why not? Thanks for joining the MuscleTribeofDanger&Excellence Duane! But its a league, but I don't wanna call it my league. And its definately not my team. You can't just join HoHo Racing - you gotta be born into it! You are the man with the plan, works for me and I am in. Whats the segment and grand prizes? DO we get a trophy posted beside our username or some other sort of recognition, I think I have space for all 4 segments and the grand prize in my signature. BOOGITY BOOGITY BOOGITY! Here is the coveted prize!!! !